Harvard will go to great lengths to recruit and retain faculty members. But sometimes, it doesn’t have everything a professor wants. When Henry Louis “Skip” Gates Jr. left Duke in 1991, he came to Harvard because administrators offered him the chance to build the African and African American Studies Department from the ground up. And Gates knew that commitment was genuine. In the years that followed, Gates attracted a group of superstars in the field—Evelyn Brooks Higginbotham, Cornel R. West ’74, William J. Wilson—to his department, hosting similar dinners. Gates said people often ask how he convinces academics to join him at Harvard, how he “bought” them, so to speak. But he argues that individuals worthy of Harvard tenure—“scholars of the first order of eminence,” as faculty guidelines state—cannot be bought. At the same time, there are other factors—sometimes financial—that bring faculty to and from Harvard. These are highly specific to individual circumstances, and what attracts one professor to Harvard might be the very factor that prompts another to leave. Administrators focus on recruiting and retaining top-notch faculty, sometimes incentivizing them to stay with waived down-payments on mortgages, prime spots on the years-long child care waitlist, or honors such as the prestigious Radcliffe professorships. Other times, though, Harvard cannot offer some professors what they need to stay: a job for a spouse, proximity to an aging relative, or significant laboratory space and equipment. Indeed, star departures in recent years indicate that Harvard may not always have what every professor wants. In the fall of 2015, for example, Raj Chetty, a MacArthur-winning economist projected to receive the Nobel Prize, traded Harvard’s ivy tower for Stanford’s sunny, buzzing campus. And Harvard’s administrators have noticed. Julio Frenk, former dean of the School of Public Health, turned down several job offers from Harvard’s peer universities. That is, until the University of Miami offered him its presidency. For Frenk, the decision to leave depended on “a unique combination of factors”: good timing, a job offer geared toward his research interests, and the opportunity to follow in the footsteps of one of his mentors, University President Drew G. Faust. Frenk can count himself among the faculty members who have recently left Harvard to pursue their careers elsewhere. Smith said he sees the ebb and flow of the faculty as varied, highly specific, and constant. Over the past couple of years, Harvard’s peer institutions have “poached” top professors in fields ranging from history to the study of religion. Last semester, History professor Niall C.D. Ferguson announced that he would leave Harvard for Stanford’s Hoover Institution, an American public policy think tank that will not require Ferguson to teach. 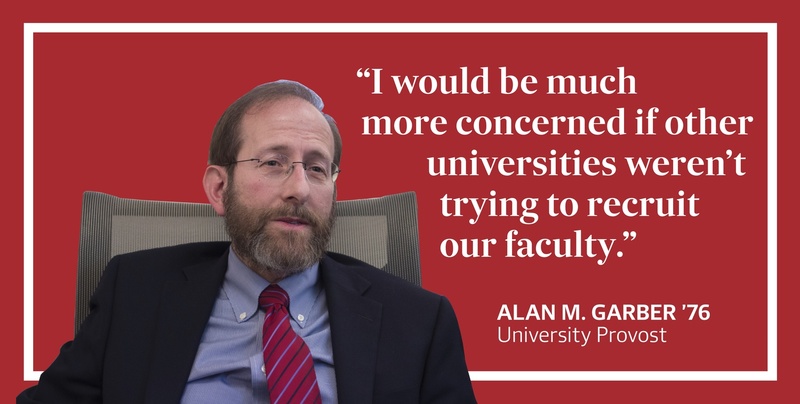 University Provost Alan M. Garber ’76 said professors’ departures are inevitable, but they do indicate the depth of talent at Harvard. "Let me just say that I would be much more concerned if other universities weren’t trying to recruit our faculty,” he said. 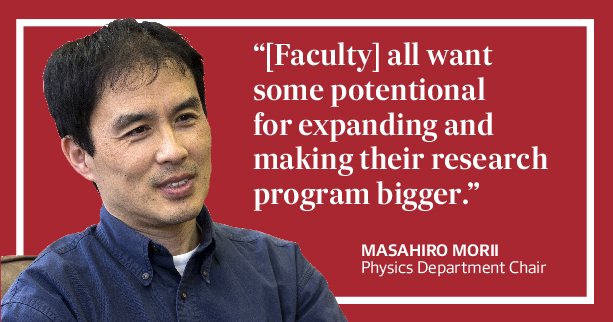 And for Physics Department Chair Masahiro Morii, concerns arise around Harvard’s lack of clarity about future opportunities for physical expansion. He said the department has faced difficulties in hiring new research-based professors because of limited office and laboratory space. Harvard’s tenure policy—which offers academic job security only at the full, rather than at the associate, professor level—also may influence tenure-track professors to accept offers elsewhere. Though Smith said administrators aim to provide competitive benefits for faculty, there are lines he will not cross. In order to defend against outside recruiters and retain its faculty members, Harvard capitalizes on work-life factors that could give it a competitive edge. Many professors say Harvard’s location is a strong asset that the University can leverage in the hiring process. For faculty with spouses, the large metropolitan job market—not only in academia but also in technology, medicine, and law—entices couples to come, Morii said. When Morii arrived at Harvard as an assistant professor in 2000, for instance, his wife was still a postdoctoral fellow. Choosing Boston, with its many universities and colleges, he said, was better than going to an isolated state university. Some also appreciate the Boston area as a place to start a family, given its highly-ranked public school districts. The Cambridge area is also expensive. The average single-family home costs nearly $1.5 million, and it’s a seller’s market, with the average house going for 107 percent of its list price as of last March, according to real estate agent Charles P. Cherney ’89 of Hammond Residential Real Estate. So Harvard, like most peer institutions in metropolitan areas, offers faculty housing assistance. Lamont said Harvard offered two faculty members—recently promoted in the Sociology Department—loans without interest for housing. In other cases, Harvard will help with the initial down payment for a mortgage, Morii said. “Housing plays a large part in all [recruits’] consideration to come to Harvard,” Susan Keller, director for faculty real estate and special projects, wrote in an emailed statement provided by Harvard Spokesperson Brigid O'Rourke. According to Keller’s statement, Faculty Real Estate Services offers two condominium options, developed on University land, priced more than 20 percent below fair market value for eligible faculty. In addition to housing, childcare costs can also be sky-high in the Boston area. There are six Harvard-affiliated child care centers on campus, but fees can balloon up to $34,944 for a single child per year. And even obtaining that expensive childcare can be difficult; according to Senior Vice Provost for Faculty Development and Diversity Judith D. Singer, the six daycares have just 380 combined slots. Individual centers can receive as many as half a thousand prospective applicants. 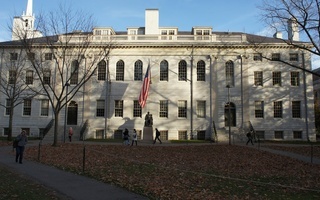 Harvard has in recent years established programs to subsidize childcare, such as Ladder ACCESS, which provides up to $20,000 to eligible faculty with children under the age of 6. And for top talent, the University maintains a “Provost’s waiting list,” created specifically for recruitment and retention, according to Singer. Highly sought-after individuals placed on the list will be given priority for spots in Harvard’s daycare center. But childcare and housing are not why most faculty come to Harvard. Indeed, the network of colleagues across fields continues to draw academics. 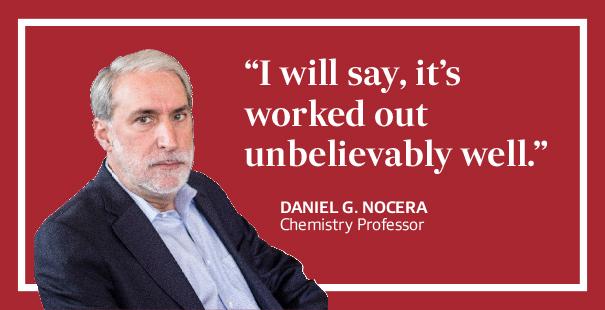 Chemistry professor Daniel G. Nocera, who left MIT for Harvard three years ago, said that Harvard’s emphasis on the liberal arts and a strong faculty and alumni base compelled him to make the move. Smith, the FAS Dean, said another draw are Harvard’s many graduate and professional schools, which offer faculty more opportunities to interact with students and practitioners in their field. One academic “secret weapon” Harvard also employs in recruiting faculty are the Radcliffe professorships, Singer said. Created by Faust when she was dean of the Radcliffe Institute for Advanced Study, the professorships offer new hires the chance to pursue independent research for four semesters of their first five years at Harvard without teaching. This setup gives faculty time to focus on their research, a very attractive proposition for many. According to Radcliffe spokesperson Alison Franklin, when a school’s dean identifies a “good fit” for a Radcliffe professorship, the dean can contact Radcliffe about a potential joint appointment. If Radcliffe administrators agree with the dean, the candidate receives an offer for a professorship at the institute. In the end, though, the reasons for coming to, staying at, or leaving Harvard vary from case to case. Faculty of Arts and Sciences members voted unanimously in favor of legislation requiring students at the College to make an affirmation of integrity, and for the establishment of a new Theater, Dance, and Media concentration. In the wake of the recent release of a campus sexual climate survey, some departments in the Faculty of Arts and Sciences aim to clarify reporting procedures and promote clear departmental expectations regarding sexual harassment.